Rockwerx will guide you through every single step of building your next-generation climbing wall, leaving no questions unanswered and no detail overlooked. Whether you want to build the biggest competition climbing venue in the world, add climbing to your recreational or multi-use facility or create a unique climbing adventure for your kids in the back yard, Rockwerx does it all. Their designs and engineering methods have stood the test of time, providing Rockwerx's reputation in the industry for revolutionary and reliable builds. If you want your facility to push the industry standard, contact Rockwerx. The PinnacleTM and The PointeTM are realistic rock-type climbers that bring a natural look and a challenging climbing experience to the playground. Each of these versatile, natural elements can be integrated with a new or existing PlayBoosterTM playsystem, featured as an independent play event or grouped together in clusters to create a stunning playground centerpiece complete with tunnels and archways. However you use them, your kids will love to explore every fissure, handhold and climbing route on the incredibly detailed surface. The Pinnacle and The Pointe were designed specifically for the playground. They are constructed from glass fiber reinforced concrete (GFRC), which makes them incredibly durable and gives the surface a realistic feel and texture. 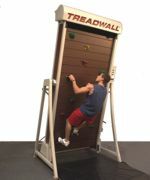 Treadwall® M4 Series is a radically new Treadwall offering a compact footprint, whisper-quiet operation and pricing that fits the budget of any youth or adult training program. Designed to complement traditional cross-trainers and bring new excitement to adult training, Treadwalls are also the key components to successful youth fitness programs. Climbing allows kids to be themselves while exercising. As always, users can choose self-paced or continuous climbing combined with proven motor-free engineering and the M4's innovative new way of changing angles while climbing. Try adding the colorful KidWall option for younger kids. The STRATO Rock Climber has a realistic-looking design, featuring various degrees of challenge for users of all abilities. It features ADA ground-level elements and an optional slide attachment. With today's manufacturing capabilities, a more innovative approach to play is evolving. It enables Cre8Play to think outside the box and develop custom environments where children are encouraged to take appropriate risks, try new experiences and stretch their imaginations. Cre8Play designs, creates and installs custom-themed 3-D sculptural play elements for indoor and outdoor play areas. Ropes Courses Inc. has designed and patented an Adventure Course known as the Sky Trail®. This course has been created to meet the needs of customers by addressing safety, high volumes of participants, scalability, easy training of operators, ability to theme and changeability. Sky Trail® courses have a relatively small footprint. The course can be installed over existing use areas, such as mini-golf, water, walkways and arcade areas. An average footprint is 30 feet by 60 feet. Ropes Courses Inc. also creates climbing structures, bridge walks and zip lines for general public use. Kids love to climb, whether it's on chairs, over desks or in trees. They know the thrill of overcoming physical challenges and conquering new territory. Encourage that sense of adventure and develop their natural athleticism with a climbing wall. ClimbingForKids.com offers everything you need to get started with a climbing program at your school or facility, at a price that's lower than you'd expect. All products are specially designed for young climbers, so your students can learn safe climbing techniques in a controlled environment.